So, Halloween came and went. And you are probably dealing with the come-down from a mega sugar high. The only way to get on with your day is a hearty, healthy breakfast. Welcome, Bakery on Main’s new Organic Creamy Hot Breakfast. With two options available, Amaranth Multigrain and Quinoa Multigrain, each serving of the new breakfast product offers of 27.5 grams of whole grains. The grains are also a excellent source of ALA Omega-3 as well as a good source of fiber. 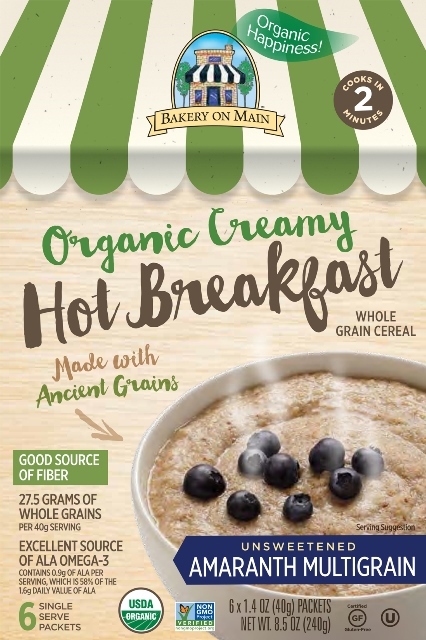 Plus, Bakery On Main’s Organic Creamy Hot Breakfast is also Non-GMO Project Verified, OU Kosher, and free of sodium, cholesterol, saturated and trans fat, dairy, casein, wheat and gluten. With all that goodness, Bakery on Main could get away with not necessarily being delicious; however, it is and the serving possibilities are endless. We loved serving it with sliced bananas, almonds and cinnamon, but each option would be great topped with any type of fruit and maybe a splash of syrup, to sweeten it up for the kiddos. (What parent wouldn’t want their little ones to load up on ancient grains instead of sugary cereal in the morning?) And now that the 100-degree days are behind us, this warming bowl definitely satisfies our craving for something comforting and cozy to start the day. Dishing up the Organicl Creamy Hot Breakfast is super-easy and quick, too. No fiddling with the stovetop in the morning. Just add water and pop in the microwave. Available at natural food retailers across the country and online for an SRP of $5.99 per 8.5-oz. box (each with six individual serving packets).